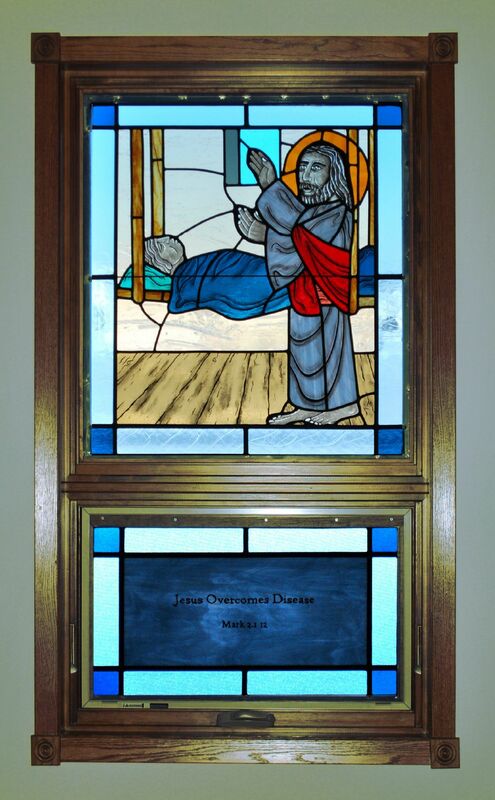 The church sanctuary is graced with a series of stained-glass windows, inspired by scripture from the Gospel of St. Mark. The designs were done by Rev. 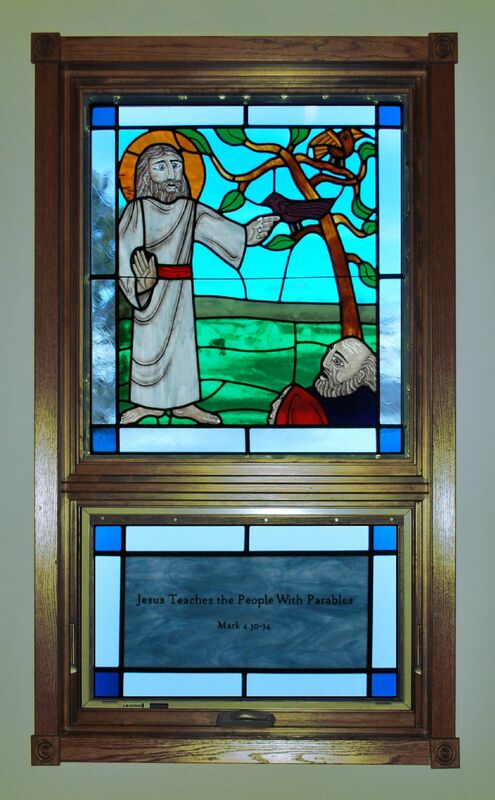 Nathan Pope (Pastor Emeritus at First Evangelistic Lutheran Church, Racine, Wisconsin) and installed in 2014. They were featured during the Sunday service of December 14, 2014, and the text below is from that sermon. What is the purpose of art in worship? Art has a way of capturing with pictures and symbols what is spoken with words. It’s meant to summarize and solidify the truth of God’s Word through sight. 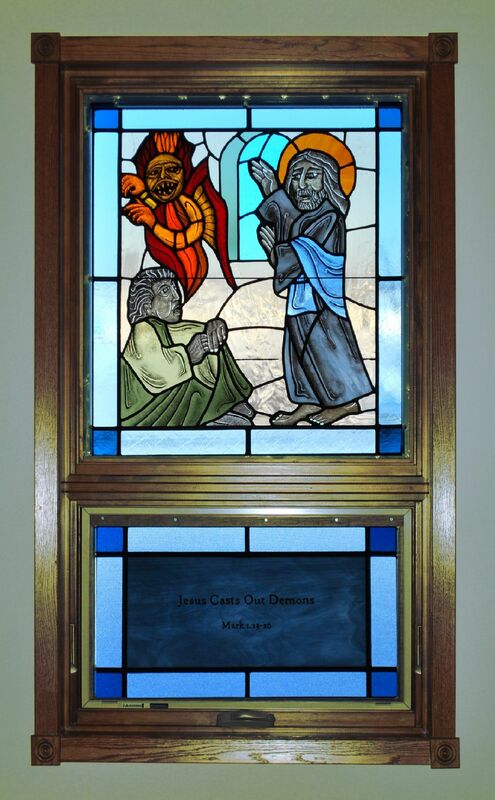 The stained glass windows all portray a theme. 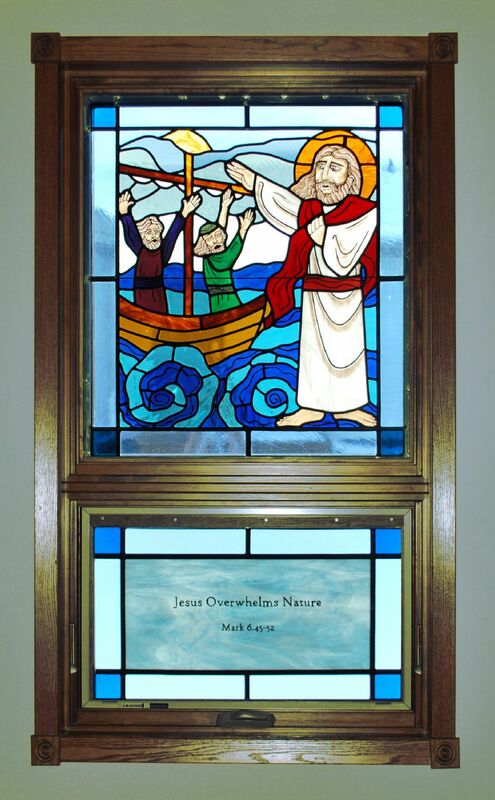 Since our congregation is St. Mark’s each of the windows picture something from the Gospel of St. Mark. 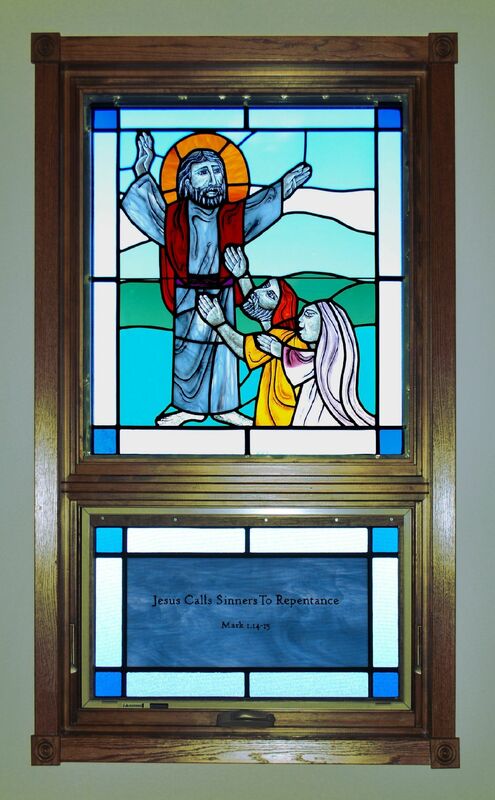 The theme of Mark’s Gospel is “How Jesus Shows that He is the Son of God.” So the windows picture events that show that theme. Just a few things to point out before we begin: Notice that in each picture Jesus’ mouth is open. Why? Because in each case Jesus is talking, sharing His almighty, divine words. Notice also Jesus’ expression in each window. 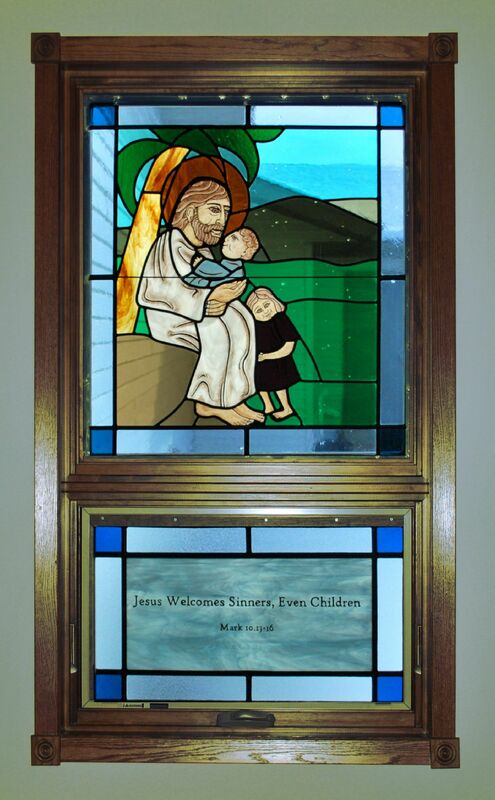 The closest we come to Jesus smiling is in the one with little children, but as you’ll see in that account we’re told that Jesus was angry with His disciples. There’s actually no Scripture passage that tells us Jesus smiled. So in each window Jesus has a serious look on His face. Why? Because in each case Jesus is dealing with something very serious: repentance, driving out demons, healing disease, teaching, death, nature, welcoming sinners. Who here would go to your doctor and ask for a prescription of chemotherapy pills so you can start taking them for fun? Anyone? Who hear would like to take antibiotic just for fun? Anyone? Who hear would like to replace their snack time today by taking a 30 ml of cough medicine? Anyone? I’m guessing not many of us would volunteer for such medication. Why not? Because you don’t take medication if you don’t need it or don’t think you need it. Now, let’s say you get diagnosed with cancer and it’s a form that is very treatable by taking some pills, are you going to take those pills? I’m guessing! Or the doctor discovers you have an infection that is very treatable by antibiotics, you’re going to be glad to take the medication! But that’s not it, notice what else Jesus says, “Repent and believe the good news!” Believe the gospel! Yes, you are a sinner condemned to hell, but God’s done something about that! He sent Jesus – the essence of good news – who not only told us the good news but accomplished the good news by living perfectly for us and giving Himself up to death on a cross to pay for our sins and rising from the dead that you may know without a doubt that your sins are forgiven! That’s the cure! That’s good news! So, thank you Jesus for calling sinners like you and me to repentance and faith in the good news! Mark 1:23-26 – Just then a man in their synagogue who was possessed by an impure spirit cried out, “What do you want with us, Jesus of Nazareth? Have you come to destroy us? I know who you are—the Holy One of God!” “Be quiet!” said Jesus sternly. “Come out of him!” The impure spirit shook the man violently and came out of him with a shriek. So why is there a window with a demon on it? Well, first, it pictures a real, actual, historical event recorded by Mark in God’s Word. But secondly, it also helps us understand that the devil and demons are a very real reality in the world. In America, the devil has found much success in convincing us that he’s not real. Demons are a feature of absurd Hollywood movies, but that’s it. And if the devil can convince us that he’s not real, then he’s also not a threat and we don’t have to worry when we sin and put ourselves within the devil’s reach and set ourselves up for harm. But what does Jesus do here? We aren’t helpless pawns that the devil can do whatever he wishes with. Jesus drove the demon out! Jesus has power over the devil! Jesus has power over evil! Jesus even uses this case where someone was possessed by a demon to show us that He has the power over Satan and his minions. Because of Jesus, the devil has no power over you either. Because of Jesus, the devil has to flee at God’s Word. Because of Jesus, the devil has been crushed! While this window may seem scary- who is scared in it? The demon is scared… of Jesus. What is it that scares you? What is it that frightens you? 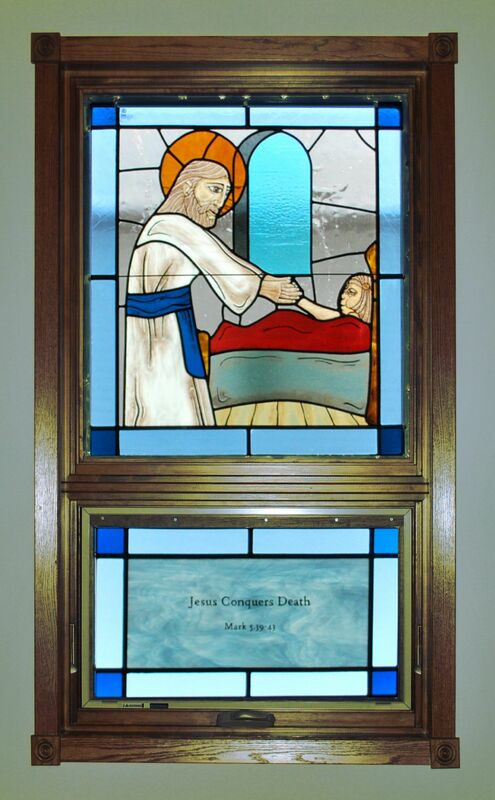 May this window remind you that no matter what scares or frightens you – Jesus, your Savior, is more powerful than it! That’s what we see in this text and in this window. Guilt is a horrible thing. Why do we struggle with guilt? Simply, we struggle with guilt because we sin. Remember, sin isn’t just doing something wrong – like lying, acting selfishly, but it’s also failing to do something – like failing to trust God 100% or failing to love my neighbor all the time. How many times have we done that? How many times have we done that just today? No wonder we have guilt. Well, here Jesus was teaching in Capernaum and so many people came to see Him that there wasn’t room left in the house. Then these men came bringing their paralyzed friend to Jesus and since they couldn’t get to Jesus because of the crowd, they climbed on the roof and lowered the paralyzed man down in front of Jesus. Now stop. At first glance we might assume that this guy’s greatest need would be to walk since he’s paralyzed. So we might expect Jesus to just heal him. But notice what Jesus said, “Son, your sins are forgiven.” What was the first thing Jesus did? The first thing Jesus did was assure him that his sins are forgiven. Why? Because when this guy died, it wouldn’t make a difference whether or not he could walk. But what was going to matter is if he knew that his sins were forgiven. And so Jesus deals with what’s most important first: he assures him that his sins are indeed forgiven. And so, Jesus does the same with you and me. No, maybe he hasn’t healed your sickness like you want or fixed all your problems, but he’s given you what’s most important: the forgiveness of all your sins! He proved it by dying on the cross and rising again for you! But some religious leaders are there and they say Jesus is blaspheming by claiming to be God and forgiving sins. So, Jesus confronted them with a question: Which is easier? To say your sins are forgiven or to say get, take your mat and walk”? Of course, any normal human being couldn’t do either. So Jesus said to the man, “I tell you, get up, take your mat and go home. He got up, took his mat and walked out in full view of them all.” If that man got up that was proof positive that Jesus IS God and HAS the authority to forgive sins. And the man got up! And so, Jesus is God and has the authority to assure you that your sins ARE forgiven! Think about the life of Jesus. He was a little known teacher from a little known village of Nazareth and he was calling very little known disciples to follow him. Jesus’ kingdom seems so small, almost insignificant to human standards. It’s a kingdom without armies and weapons as we think of them, without an imposing king, without seeming grandeur and riches. Jesus Himself seems so lowly and just gets lowlier dying like a terrible criminal on a cross. Even today Jesus’ kingdom seems to just struggle on, so small, so lowly, people don’t stand in line to get a seat in church. And even our lives seem so small and insignificant. It sure doesn’t always feel like you and I are eternal sons and daughters of THE King immortal and eternal, does it? Here Jesus teaches in parables- earthly stories that we can understand and they illustrate an important spiritual truth. Here Jesus says that His kingdom is like a mustard seed- so small, so insignificant- and yet, it grows to become a tree so large that birds (thousands of times bigger than a mustard seed) can perch in its branches. Look at what Jesus’ kingdom has become and what the gospel has done! What started so small has been spread and continues to be spread so that there are God’s people all over the world. And one day God’s kingdom will be seen by us to be the greatest Kingdom of all when Jesus returns as the King of kings and we, though often feeling weak and insignificant on earth, will rule with Jesus in the glories of heaven forever. Thank you Jesus for teaching people with parables! Mark 5:39-43 – He went in and said to them, “Why all this commotion and wailing? The child is not dead but asleep.” But they laughed at him. Mark 6:45-52 – Immediately Jesus made his disciples get into the boat and go on ahead of him to Bethsaida, while he dismissed the crowd. After leaving them, he went up on a mountainside to pray. The disciples were terrified. They had been straining at the oars, the wind was against them, was it a storm? Were they fearing for their lives? Were they facing a watery grave? Then, even more terrifying, there was this figure walking on the water. Is it a ghost?? They’re terrified. Then immediately Jesus opened his mouth, “Take courage! It is I. Don’t be afraid.” Then he climbed into their boat and the wind died down. And the disciples were just amazed. Not only does Jesus walk on the water, the wind dies down when he climbs into the boat. What’s chaotic in your life? What danger looms large for you? What disaster might you face tomorrow? What natural disaster may come? See your Jesus here overwhelming nature. See your Savior as the all-powerful one who can still storms and silence winds. See your Savior who can do anything! Mark 10:13-16 – People were bringing little children to Jesus for him to place his hands on them, but the disciples rebuked them. When Jesus saw this, he was indignant. He said to them, “Let the little children come to me, and do not hinder them, for the kingdom of God belongs to such as these. Truly I tell you, anyone who will not receive the kingdom of God like a little child will never enter it.” And he took the children in his arms, placed his hands on them and blessed them. Here is one of the most saddest and most comforting accounts recorded for us in the Gospels. Perhaps we can try to excuse the disciples by saying that they were trying to protect Jesus from some needless interruptions, save his time for more “important” things. But that’s exactly what’s so sad about this. By preventing children from coming to Jesus they showed that they didn’t think children could benefit from Jesus, that children were not as important as others, in other words, that Jesus has come for only some, but not all. But notice what Jesus became. He became angry with his disciples for preventing children from coming to Him. Does this happen today? It happens when parents refuse to bring their children to the baptismal font to be adopted into God’s kingdom, it happens when parents neglect their most important work of spending one on one time talking to their children about Jesus, it happens when any of us begin to think that Jesus has come just for certain people and not all. But what did Jesus say? “Let the little children come to me, do not hinder them, for the kingdom of God belongs to such as these.” Then Jesus holds up a young child as an example of the only way that we can enter the kingdom of God. Only by a child-like faith, simple faith and trust in Jesus who died for sinners, rose for sinners, and by grace welcomes sinners- like you and me- into His eternal kingdom.